The flag pole at our place is about seventy-five yards from the country road that goes past. It is visible from the road to a point where our lane makes a bend. I remember that we made it from replaced drop pipe from a country well. It rises in the air to more than thirty feet and on its concrete base is engraved the date it was put up: 25 May 1986. 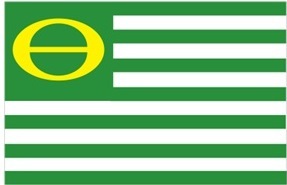 Once we had it up we had to decide: What flag would we fly from it? The first choice was obvious, I suppose. 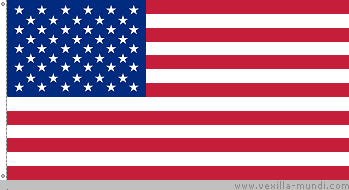 We ran up the Stars and Stripes, at first raising it in the morning and lowering it at night. Later, our habits grew relaxed and we didn’t much bother with the ceremony and seldom took it down. We soon discovered that if the flag is allowed to fly in most all kinds of weather, then it is best to invest in a sturdy outdoor nylon one—printed polyester flags just can’t survive the inclement weather, especially high winds, for long. Recollecting the next choice of flags to be raised, the Minnesota state flag was flown. It was the current flag, of course, which had a certain official presence to it, but, from the first, we were not really enthusiastic about it nor did we feel emotional attachment to it. With no special routine or schedule, we took to flying both the U.S. flag and the state flag on no special days or times—and often both from the same pole. Next, I recall, a family member presented us with an Ecology Flag. Remember that flag? It was from the late sixties: seven green stripes and six white, with a green canton charged with a yellow/gold symbol combining an “E” and an “O.” Unfortunately, its life was short because the flag material was a cotton bunting fabric which frayed rather quickly. We saved the canton area, strengthened by the sewn-on nylon symbol. It was and still is a striking banner—symbolic now more than ever. 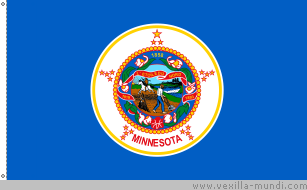 It was around this time that, for us, the Minnesota flag was lacking as a strong and unique symbol for this beautiful state. What I thought of doing about that is another story related elsewhere. For a week in April, we note the birthdays of my mother and me by flying the flag of France. 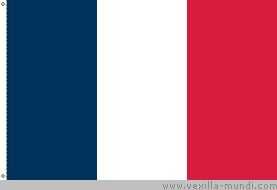 And again on the fourteenth of July we raise this flag in recognition of France’s celebration of Bastille Day. Other observations of national significance we signal with the Stars and Stripes: Presidents Day, Memorial Day (flag at half-staff), and Veterans Day. But on the Fourth of July, we honor our country’s origin by flying the replica of our nation’s first flag—the Betsy Ross flag with a circle of thirteen stars—a very special day. We have found, like many other people, that flags speak for those who hoist them high to show others their respect and feelings for events and people. ~ by marcstratton on 1 May 2007.